I know Valentine's Day isn't fun for everyone, (believe me, I really, really, do know this), but darn it all, the chocolate part is awesome. Who doesn't love chocolate dipped everything? These couple "recipes" are so easy to do you'll wonder why you ever paid for anything covered in chocolate and why you didn't just do it for yourself. This goes for the chocolate peanut butter candy, too. I sent these off to Disney a long time ago, and I'm repeating them here because they're just too worthy of being shared. My youngest (who is now 11) loves helping make anything sweet. I suspect this is simply because she loves to consume anything sweet, but at this point in the parenting game, I'll take anything. Once you've made up a batch of Chocolate Dipped Strawberries, you'll be armed an ready to face your true love and they won't care if you don't have a diamond for them this year ... sorta. 1. Place chocolate in the top of a double-boiler or a heat-proof bowl set over a pan of simmering water. Stir chocolate until melted, about 5 minutes. 2. Line a cookie sheet or tray with waxed paper or parchment paper. 3. Dip strawberries, one at a time, into the melted chocolate. These can also be dipped into nuts or sprinkles once they are coated in chocolate. Set on paper lined tray and chill for 20 minutes until set. Longer than an hour in the refrigerator will cause condensation on the strawberries, so be careful not to overdo it. 4. Place strawberries into a lined box or pretty mini-cupcake liners if you're giving as a gift. 1. Pour the chocolate chips into a microwave-safe bowl and microwave at half power for one minute. Stir with a silicone spatula. Continue to microwave at intervals of 15-60 seconds until chocolate is completely melted. Stir until smooth. 3. 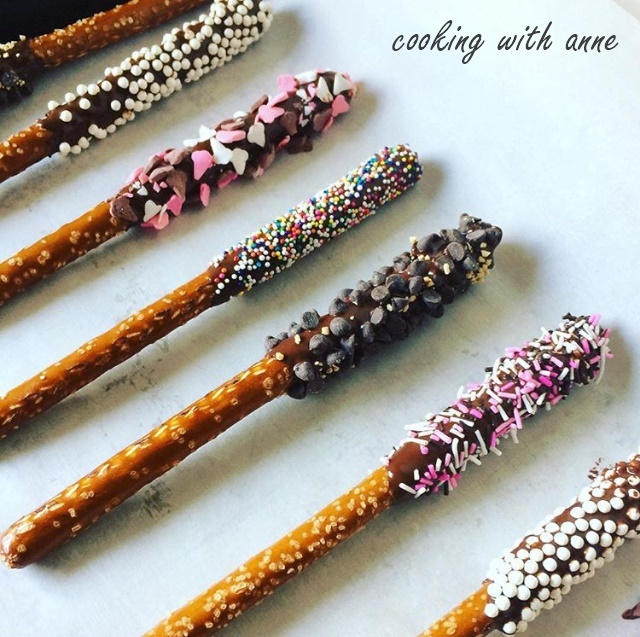 Dip the coated end of the pretzel into sprinkles, nuts, tinted shredded coconut, or anything for extra color. Stand up in a glass or lay on a cookie sheet (prepared with cooking spray or lined with waxed paper) until set. 1. Melt together peanut butter and butter and blend until smooth. 2. Add in graham cracker crumbs and powdered sugar. Mix well and press evenly into an 8x8 baking pan that has been fitted with parchment or waxed paper. 3. Melt chocolate chips until smooth and pour over peanut butter mixture. Smooth over the top and refrigerate half an hour until firm. 4. 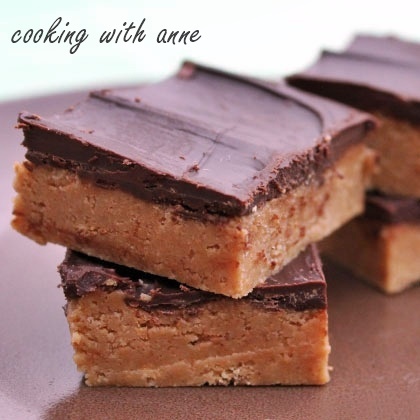 Let stand at room temperature for 10 minutes before cutting into bars. I love that we have a two-fer in February as far as holidays go, and they are two of my favorite. These recipes will help you celebrate a most delicious Mardi Gras (fat Tuesday) on February 13, this year. Try to save some room for the day after, which is a requisite chocolate consumption day - Valentine's Day. I say "try" because I know how delicious each of these recipes is and I'd have a hard time saving room, too. I originally sent these to Disney for Family.com, which is now defunct, and for a short while they were part of the web site for The Princess and the Frog before moving on to Spoonful.com. The web changes so quickly, though, and the recipes are no longer there. Through the magic of Archive.org, here is a link to where they were housed on Spoonful: Archive.org - Spoonful.com Great Mardi Gras Recipes. I have already shared several of them here and you can find links to those at the end of the post. Here are the final three, Red Beans and Rice, Shrimp Jambalaya, and Beignets - Enjoy! This thick and hearty stew-like dish is Cajun cooking at its finest. Red beans and the Cajun 'Holy Trinity' of celery, onion and green pepper combine with smoked sausage to make one fine meal. Add more Cayenne or hot sauce as you see fit, there's no way to get that part wrong. water in a large Dutch oven. 2. Heat to boiling and reduce heat to a low simmer. Lid tightly and cook for 2 hours. The French word for ham is 'jambon' which is where the term 'jambalaya' comes from. Any jambalaya just isn't right to me if it doesn't contain the smoked meat. This shrimp version is quick and flavorful with just the right kick. 1. Heat a large and deep skillet over medium-high and add oil. 3. Add ham, tomato and chicken broth and heat for 2 minutes. and cook for an additional 5 minutes, or until shrimp is pink. Serve hot. A morning in New Orleans wouldn't be the same without beignets and cafe au lait made with chicory (see Cafe du Monde). NOLA's answer to doughnuts, the beignet is a light and airy fritter sprinkled with mounds of powdered sugar and served in threes -- the only way to enjoy them to their fullest. 1. Stir together yeast and warm water until yeast is dissolved. Let stand 5 minutes until bubbly. 2. Add in evaporated milk, sugar, salt, oil and egg and stir until well blended. 3. Add the flour one cup at a time, stirring with a wooden spoon until a soft dough forms. 4. Cover with plastic wrap and refrigerate for 4 hours or overnight. 5. Punch dough down and roll into a rectangle 12 by 8 inches. Cut into 2-inch squares and let stand for several minutes. 6. While dough is standing, heat frying oil to 360 degrees. Make sure oil is at least 2 inches deep. 7. Fry dough squares, a few at a time, until golden brown on both sides. Remove to paper toweling to drain well. 8. 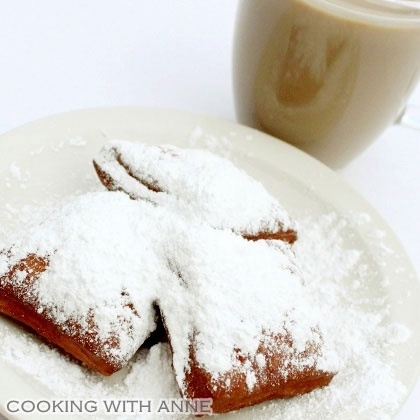 Shake powdered sugar over beignets and serve warm with cafe au lait! Pantry staples are a must in a large family. Weekly shopping is tedious enough for us without having to resort to trips throughout the week to stock up. This is especially true in the winter when much fresh produce just isn't the same quality or affordability that it is in warmer months. Turning to your pantry for more than half of your meals isn't a bad thing, it's a decidedly good thing, especially with quality canned goods. ShopRite has standards that many other brands don't, and it's evident in the beans and tomatoes used for this recipe. The imported cherry tomatoes are like little orbs of sunshine in a can. The flavor is bright and blends well with tiny little white beans. If you can't find fresh cherry tomatoes at any time of year, the imported babies from ShopRite are a very fine substitute. This can be made with pork or chicken, the cooking time is just about the same for both. The leek adds a dimension of flavor that we really love here, but if you aren't mad about leeks, shallots or even spring onions will do well. About a cup of chopped green onion or 2 small shallots should do the trick. 1. Cut the dark green portion from the leek and discard. Cut leek in half lengthwise and rinse well to remove any sand or grit. Slice thinly. 2. Heat oil in a large skillet over medium heat and add leeks. Cook briefly until leeks begin to wilt. Push aside and add pork. 3. Sear pork on both sides, 3 minutes per side and add chicken broth to pan. 4. Cook over low heat until broth is reduced slightly and pork is cooked through - about 5 minutes. 5. Add beans, thyme and drained tomatoes. Heat through for another 5 minutes. Add salt and pepper to taste.